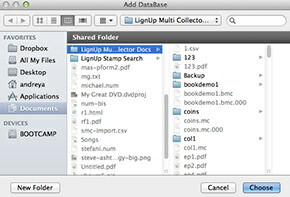 Use 'Database Manager' at the startup or menu File -> New to create new database (collection). Watch quick start video tutorial as an example of new database creation. Use this button to create a new database using available online templates. 'Choose database location' - Name of folder for new collection (Example - mycoins). 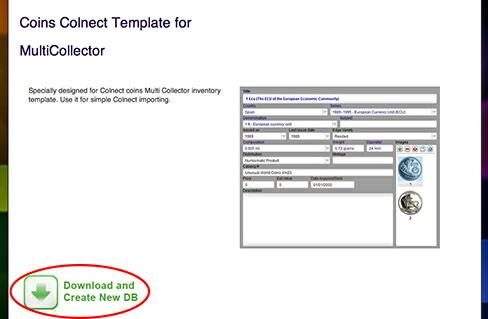 'Enter collection name' - Database name (Example - coins from colnect). 'Customize structure' - Check to edit database template immediately after creation. 'Choose Icon' - Select icon for database. 'Custom Icon' - Choose your jpg/png/bmp file to be used as database icon. 'Show All' - Show all available (predefined) icons. 'Images for preview' - Number of images you'd like to see in the thumbnails. 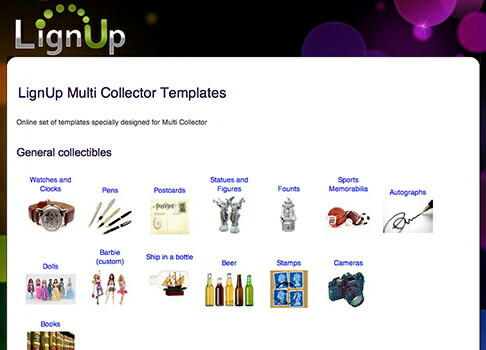 Use this button to start a new database on the base of the Multi Collector universal template or generate empty template. 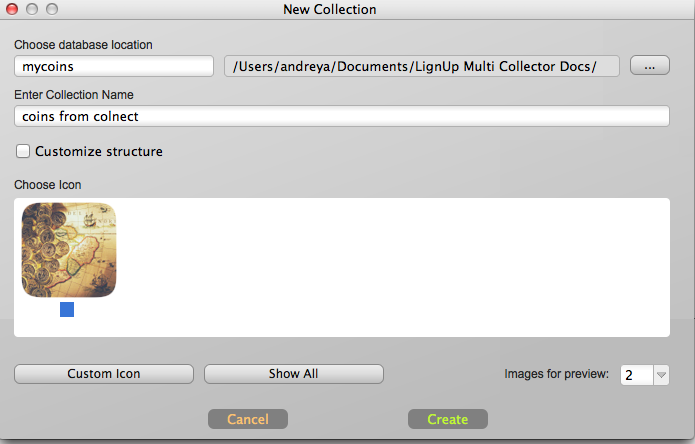 'Choose database location' - Name of the folder for the new collection (Example - mycollection17). 'Enter collection name' - Database name (Example - My Collection). 'Customize structure' - Check to edit the database template immediately after creation. 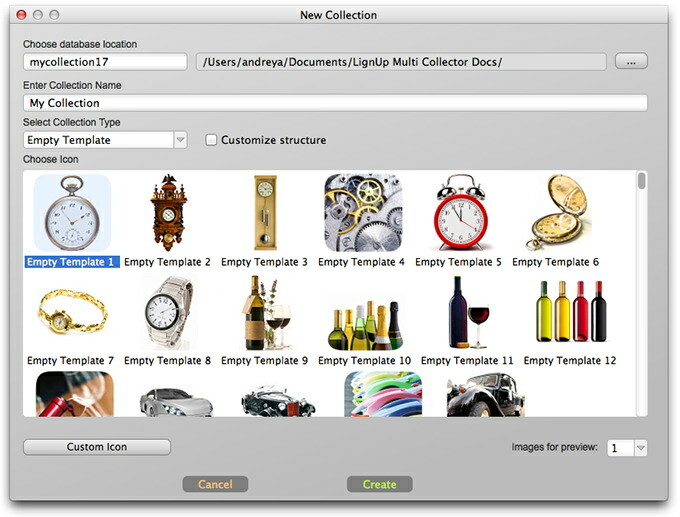 'Select Collection Type' - Choose one of the available templates: watch, models, cars, wine and dozens collectibles. To start the database with an empty template, choose 'Empty Template'. 'Choose Icon' - Select an icon for the database. 'Custom Icon' - Choose your jpg/png/bmp file to be used as the database icon. Use this button to start a new database with an identical template of any existing Multi Collector database.